The Hollies Kessingland is the perfect place for camping, touring and glamping. Whether you are a couple seeking a romantic getaway, or a family looking to spend quality time together, Kessingland is a fabulous location for your holidays. This seaside resort area is a short drive from Great Yarmouth and has many other local attractions, including the Africa Alive wildlife park, and Pleasurewood Hills Theme Park. 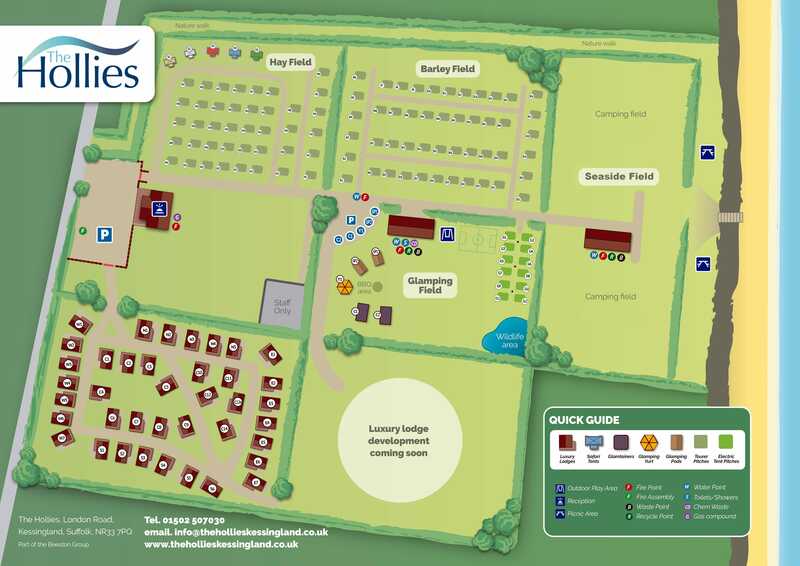 The park allows for up to 425 tents and touring pitches and has approximately 75 lodge holiday home plots. There is ample space for you to enjoy outdoor pursuits or picnics at the beach during the day and retreat at night to sleep peacefully under canvas. Every facility is provided for, from a small dedicated childrens play area, to pristine toilet blocks, featuring hot water showers and hairdryers. We can also supply gas if needed. Please note Barbeques and fire pits are not allowed on site.